This weeks song of the week is The Moons new single "Heart and Soul". The Moons were formed in Northampton 2008 by singer/guitarist/songwriter Andy Crofts. They currently have two studio albums "Fables of History" on Schnitzel Records Ltd (me as an austrian can only laugh about that name haha sorry) released 2012 and "Life on Earth" on Acid Jazz Records released 2010 and they just finished their third album "mindwaves" which going to be released 21 July 2014. During his time with his former band The On Offs Andy had built up a collection of demos as a solo artist. After his band broke up, he decided to upload a few of his songs on myspace under the name 'The Moons' to gain some feedback. Within days Lois Wilson of Mojo magazine had praised his song "Intermission Rag" in Mojo magazine. Shortly after Crofts decided to form The Moons. The first recorded dem was 'The Lunar Sessions', on which Crofts played all the instruments except drums, which were played by Danny Connors. Crofts released the song 'Don't Go Changin' on his own label, Colorama Records, on a limited white 7" vinyl. In the beginning live performances where done with the help of friends and other musicians but he soon assembled a regular line-up. The band line up finally consisted of Ben Gordelier (drums), James Bagshaw (guitar), Tom Warmsley (keys) and of course Andy Crofts. The Moons released their debut album 'Life On Earth' in March 2010. The album was recorded in Paul Weller's studio and featured new versions of the Lunar Session tracks and the first single released was 'Torn Between Two'. Paul Weller also played piano on the track 'Wondering' and lead guitar on 'Last Night On Earth'. They released three tracks as singles and the album made it in the top 30. They spend lots of time touring with big support slots like: Ocean Colour Scene, The Rifles and Beady Eye. Their second album "Fables Of History" was mixed and produced by Jan 'Stan' Kybert who in the past worked with Oasis, Massive Attack, The Rifles and Paul Weller. Crofts and band signed a new record deal with East London label Schnitzel Records Ltd. (haha) which was signed on a full moon 21 February. The first singles from the new album was 'Double Vision Love' and 'English Summer'. 'English Summer' turned out to be the summer anthem for many The Moons fans and also got used for Jack Wills clothing company for their 2012 Summer Holiday fashion campaign. 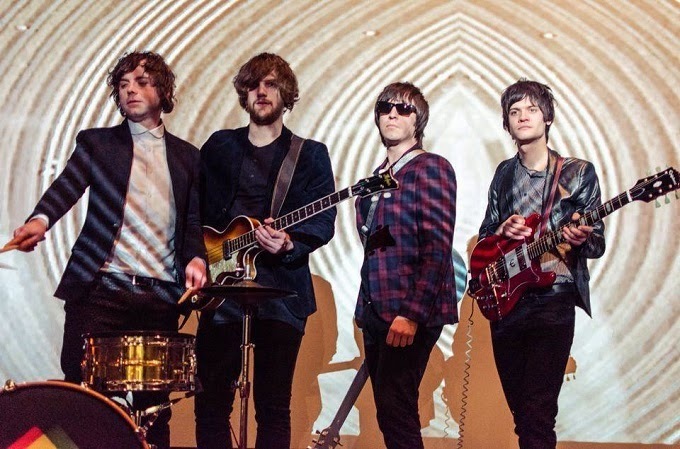 The band went through another transition after James and Tom left The Moons to form a new band: Temples. Croft recruited friends Ben Curtisw and Chris Watsn to complete The Moons line up. The final single to come from their second album was "Something Soon" which featured Paul Weller. Recently The Moons were working on a new album "Mindwaves" which is due on 21 July 2014. The first single of their new album is this weeks song of the week "Heart and Soul". They also just came back from their UK tour. Andy Crofts: "'Heart And Soul' is about a girl, a temptress who pulls you in with her looks and spits you out. A girl who reaches into your heart and soul and takes all the good out of you and then moves on to her next victim." The Moons going to release Get Heart and soul on a limited orange vinyl for the record store day on April 19th. You can get it in your regional record store or online. But be aware, there are only 400 made. I always used to like them but since they released their newest single I just can't stop listening it. I really like the lyrics and actually everything about the song. The video is also quite nice. It clearly reflects their style. But I am quite shocked or let's say confused that the guys from Temples (James and Tom) are old band mates of The Moons. I had no idea! But to be honest, I think it was a good choice, that they left the band to get started with the Temples. I really hope that I will soon have the chance to see The Moons live. Fingers crossed that they'll soon play another gig in London.